The Fiat G.91 is the Kevin Bacon of European aviation: every military aircraft that followed can be linked to it very easily, normally in one or two degrees of separation. The Sud-Est Baroudeur is no exception to this rule. Aeroplane designers hate wheels. Wheels are for cars. The weight and complexity of a retractable undercarriage is a huge nuisance. Why not do away with them altogether? The Nazi Germans were very keen on this idea and built a series of aeroplanes that took off from trolleys. The aircraft would uncouple itself from the trolley as it took-off, the trolley remaining behind on the runway. The aeroplane would land on simple skids. A trolley take-off would free an aeroplane from the need for vast, vulnerable runways. It was far easier to achieve than vertical take-off and landing. And so it was that the Sud-Est SE.5000 Baroudeur (‘adventurer’) took its first flight on 1 August 1953. It was superb. Trolley take-offs proved effortless, skid landings a delight (even in crosswinds). It could be rapidly rearmed and refuelled, and would have made a superb tactical fighter. 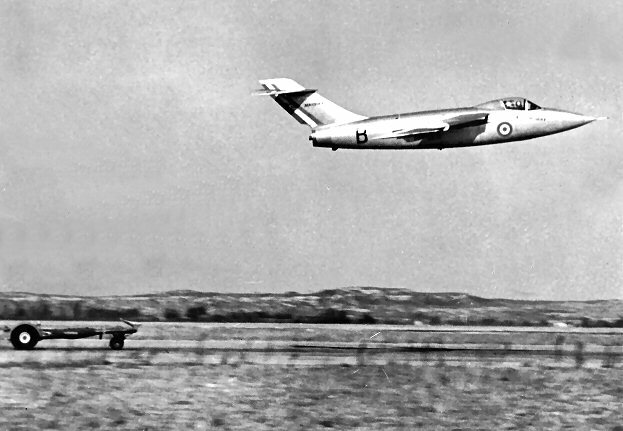 A souped-up version was offered for a NATO competition, but lost out to the Fiat G.91.